Pimples or Acne on scalp can form the same way as they do on face, chest and back. As your hair conceals acne on the scalp, you may not know you have one until you bump it while brushing or combing your hair. But when scalp acne get irritated or multiplied, even normal hair care like shampooing or blow drying become uncomfortable and painful. Further, it can cause common acne related symptoms like itchiness, tenderness, or swelling and make routine tasks such as styling one’s hair or wearing hat unbearable. Moreover, if you scratch at scalp pimples, it can lead to infection. It can be tricky to treat acne or pimples topically because the hair come in the way. When you walk into a drugstore, you will find most of the products are made specifically to treat acne or pimples on face and body. Even if you find acne scalp products, some of them may bleach your hair or make it look dirty, and moreover over-treatment can cause extra generation of oil, resulting into greasy hair. In this article, we’ll explain what causes scalp acne and various treatments for acne on the scalp, including preventive measures and home remedies. Although acne on scalp is not as much common as acne on face or back, but it forms the same way. Skin produces natural oil known as sebum. In order to form a protective layer, the sebum makes its way through skin-pores to the skin’s surface. Often the excess oil when comes into contact with dead skin cells, dirt, dust, sweat or other debris, they together clog the skin pores. Bacteria multiply in the trapped sebum and develop into a microcomedone, producing a pre-pimple. When the microcomedone gets bigger and more visible, it turns into a comedone – called as a whitehead or a blackhead. The comedone can get inflamed and red, and sometimes it may be filled with pus, and so a zit is born. So, the most common cause for acne or pimple (including one that occurs on your scalp) is some kind of blockage in the skin pores. There can also be other causes for skin’s pores blockages. Often hormones or the amount of oil that your skin produces can also be the reasons. Obviously, the people with oily skin are more prone to all types of acne. The scalp also produces natural oil. Because of hair, the sebum clings close to the scalp, leading to oil build-up. Moreover, many hair products such as from conditioners to styling gels contain chemicals that can block skin pores. Besides overactive sebum producing glands, other causes of scalp acne or pimples are hormone fluctuation, genetics, poor cleanliness, and too much use of hair care products containing chemicals. Further, scalp acne conditions can aggravate if the acne or pimples get contaminated with dandruff, scalp folliculitis, scalp ringworm, scalp psoriasis, and hair lice. As hair usually hides pimples or acne on the scalp, so the acne / pimples on the scalp become less of a cosmetic problem than the face acne, but they can still be nuisance. Also hair comes in the way of any topical medication to treat acne on the scalp. So what should we do for scalp acne treatment? At the outset, if you are susceptible to acne on scalp, you should try to prevent the acne or pimples occurrence in the first place. (i) Remove Excess Oil From Scalp Regularly: Wash your hair twice a week. But if you have oily hair or have dandruff then wash your hair every alternate day. This will prevent accumulation of sebum and in turn clogging of pores on your scalp. Because when your scalp pores get blocked, bacteria start multiplying that causes inflammation and formation of pimples filled with pus. Make it sure to neither wash your hair frequently nor infrequently, as both can cause acne breakout. So the first step towards scalp acne treatment is to wash your scalp gently but thoroughly 2-3 times a week with a good quality anti-dandruff shampoo having salicylic acid 1-3% or a scalp acne shampoo. (ii) Cut Short Your Hair (Optional): This is especially applicable if you have longer hair that gets oily quickly and if you normally wear your hair up. 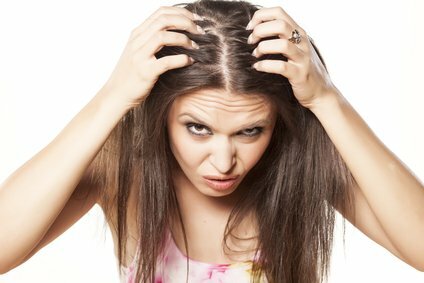 Oily hair when piled up on top of your head offers a perfect breeding arena for bacteria causing scalp acne. Shorter hair provides more room for your scalp to breathe and thus lesser chances of acne causing bacteria to thrive. (iii) Avoid The Sun’s Rays: Sun’s exposure can irritate and sunburn your scalp. An irritated scalp’s skin is prone to acne breakout. Moreover, the medication / drugs used for scalp acne make the scalp’s skin more sensitive to the sun’s rays. Better to avoid exposing your scalp to the sun, irrespective of whether you’re taking pimples medication or not. A simple solution is to wear hat when you go outside in the sun. But make sure not to wear hat for longer period of time as it can make your scalp sweat, which can also leads to acne issues. (iv) Avoid Oily, Thick / Heavy Styling Or Hair Care Products: Stay away from heavy, oily or full of fragrance products. These products – including such as hair-gel, hair spray and styling products have tendency to clog scalp pores, and thus don’t allow your scalp to breathe freely and thus provide an ideal breeding arena for bacteria. Moreover, fragrance may irritate your scalp if you have sensitive skin, making it more prone to acne breakouts. These measures alone may help you prevent and reduce scalp bumps. When you apply such a product onto your hair or scalp that does not easily evaporate or get absorbed by your skin or hair, it forms an unnatural film over your scalp. It causes significantly reduced air-flow to the scalp and the pores can become clogged due to the trapped sebum, sweat or the hair product itself. (v) Go Conditioner-Free: You need to use conditioner when you have dry scalp / dry hair; otherwise it’s a good idea to refrain from using conditioner. Abstinence from using conditioner will help in clearing up and preventing acne on the scalp. Basically, conditioner is meant to restore the moisture that has been stripped off from your hair through using shampoo, chemicals containing hair products, heating appliances, etc. Avoiding use of harsh chemicals and shampooing with a gentle shampoo will noticeably reduce your need to use conditioner. Some conditioners contain high oil content, which is not good for persons who are susceptible to acne on the scalp as the excessive oil can lead to blocked pores. Individuals who are prone to having oily hair and skin should also limit their use of conditioner because it can trigger scalp acne breakout. There is another option for individuals who have long hair. They can apply the conditioner only onto the ends so as to prevent tangling and split ends. If the conditioner does not come into contact with your scalp skin or hair roots then your scalp acne conditions should start improving. (vi) Never Squeeze Any Pimple / Pustule On Your Scalp: If you do, it will spread bacteria in the nearby tissues and can cause scarring as well. Also keep your finger-oils off your scalp. Don’t mess with the acne on your scalp. (i) Benzoyl Peroxide: This drug is one of the most commonly used medications for acne. This medication is available in many forms such as creams, gels, lotions, washes and even soaps. Gels are known to be more useful as you can leave it on your skin and allow it to take action slowly. Apply the medication on the inflicted skin area once or twice a day, unless prescribed otherwise by the dermatologist. Make it sure not to apply much onto your hair as benzoyl peroxide can have bleach your hair. (a) Benzoyl Peroxide has antibacterial properties, thus reduces the bacteria concentration on the skin. It can cause your scalp skin to go dry leading to irritation, if such is the case then consult a dermatologist. (b) It can bleach your hair so be careful. Only apply on the affected area. (ii) Salicylic Acid: This option is better than benzoyl peroxide for treating scalp pimples and acne. This has been used for many years to treat acne. It works as a peeling agent (keratolytic), so helps to loosen dead skin cells, exfoliate skin and removes outer layer of the skin – thereby it prevents follicle blockage and bumps. This compound is available on the market in many forms such as dandruff shampoos, medicated shampoos, toners, cleansers, creams, gel, liquid, lotion, foam, soap, etc. Use a shampoo that contains salicylic acid to wash your hair and keep your pores clear. Another option is to dab a small amount of gel or lotion that contain salicylic acid directly onto pimples / acne with a cotton ball. If you have numerous pimples / acne on your scalp then you can apply it all over the affected skin area. It does not have any adverse effect on your hair and will not bleach your hair or make it greasy. Most of such products are required to be applied once a day unless advised otherwise by your dermatologist. Caution: If after using this medication the symptoms worsen or a rash develop where you applied the product or you feel shortness of breath or swelling of the area / tongue stop using the product immediately and consult your dermatologist as you might be allergic to the product. (i) Tea Tree Oil: Pure tea tree oil is known to have antiseptic properties that enable it to exterminate and prevent growth of bacteria, fungi and viruses. Some research studies have also revealed that this oil can get rid of antibiotic-resistant bacteria, and thus works as a skin pore cleanser and purifier. You can buy tea tree oil as an ingredient in other products such as shampoo, or in its pure form. Regular use of shampoo with added tea tree oil will gently clean up any remaining residues which can otherwise lead to clogging of pores, buildup and bacteria breeding. This oil is capable of cutting through both natural and manmade oil-based products, thus you may use styling products in moderation without having adverse effects on your skin. To boost the cleansing strength of your shampoo, simply add a few drops of 100 percent pure tea tree oil into the shampoo bottle and mix well. As a guideline for mixing tea tree oil with shampoo, use one drop of pure tea tree oil per every ounce of shampoo in the bottle and shake well before use. Caution: Whereas tea tree oil is safe for topical application when sufficiently diluted with shampoo, conditioner, or carrier oil, it can cause irritation if you apply undiluted oil directly onto your skin. Dilute few drops of this oil with clean drinking water or some gentle oil like jojoba oil before using it as spot treatment for acne on scalp. (ii) Apple Cider Vinegar: Vinegar has acidic characteristic that breaks through tough dirt and sweat buildup, thus it can help cleanse pores, disinfect scalp, regulate pH balance and makes it less alluring and less habitable for bacteria. It rejuvenates the keratin layer of hair too. It’s an easily available ingredient and not harmful, which can be used safely without any risk. It also treats itching, dandruff, zits and head lice. Make it sure to dilute vinegar with water in 50:50 ratio before applying it to skin, so as to prevent the skin’s pH from becoming unbalanced. Also, pure vinegar application onto hair can lighten it, especially when the hair is exposed to the sunlight. Wet your hair, and then pour 50:50 rinse over your hair, while messaging your scalp. Wait for about 5-10 minutes, and then finally rinse with water. Apply this remedy 1-2 times a week to help control current scalp acne conditions, and also to prevent them from coming back. (iii) Anti-Dandruff Shampoo: This remedy can be used to treat mild acne on the scalp. Even if you don’t have dandruff it can be used as it contains ingredients such as zinc, which are known to be beneficial to acne prone skin. Also it contains substances like ketoconazole or ciclopirox that combat fungi that might be left on your skin, and thus may be able to help with scalp folliculitis. If your scalp acne condition does not improve with the above measures or if it is more severe, consult your dermatologist. He may prescribe a stronger topical medication. In case you have very stubborn acne, your dermatologist may also prescribe antibiotics or oral medication. This condition is known as a hair follicle disorder that can lead to widespread, itchy breakouts, usually along the hairline. It’s caused by bacteria and yeasts. Consult your dermatologist to treat scalp folliculitis as it needs medical treatments such as antibiotic, antihistamine, and/or steroidal therapy. So interesting and good to know!